I like to delve deeper - don’t you? 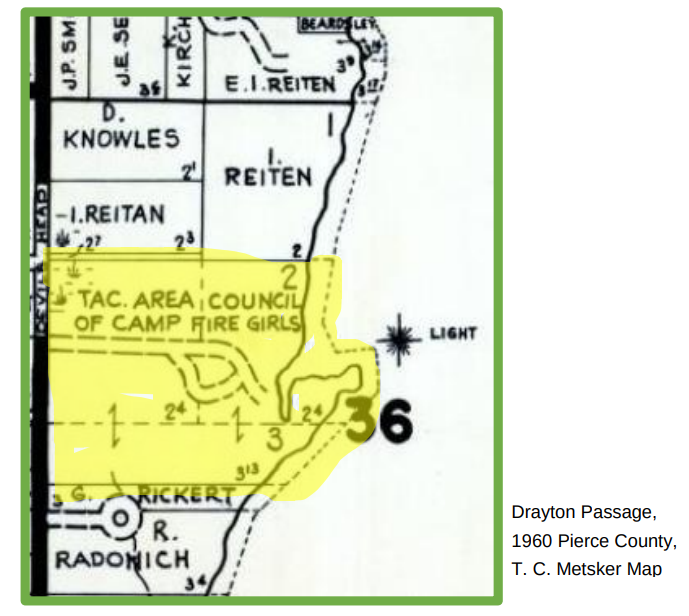 Before our amazing property was Sound View Camp, it was Camp Wakoma - operated by the Camp Fire Girls (when their organization was for girls only). This I knew already and we still have lots of reminders of over 20 years of Camp Wakoma. I asked my friend, Christine Anderson, from the Key Peninsula Historical Society, if she could dig up some land-use history for the Sound View Property. What she came up with is really cool. Residents along the shores of Drayton Passage have found arrow heads, clam shell middens and fired rocks, all which point to centuries of Indian activity on the lower peninsula. In her book the People of Cascadia, Heidi Bohan depicts the life ways of the Coastal Salish. She describes how they hunted in the woods, fished and gathered clams along the shores, and used the cedar trees to provide the materials for housing, canoes, clothing, baskets and medicine. Early Days on the Key Peninsula by R.T. Arledge details how the area’s plants were used. A prevailing need for the requirements of everyday living gave the Indians a familiarity with the location of vegetables, fruits and wild meats. Among the plants, nettles, sea arrow grass, fern roots and abundant Camus lily bulbs supplied a vegetable diet. Young willow stalks were readily available for basket weaving, and several plants provided dyes for craft work. The bark of the bear-club was used for a type of tea drink. Raspberries, salmon berries and blackberries were prized fruits which were also dried and preserved for future use. In 1833, the British-run Hudson’s Bay Company established a trading post - Fort Nisqually - in present-day Dupont. Active trade of beaver pelts, European goods and agricultural goods occurred between the British traders and the native population. The US government established a military base - Fort Steilacoom - near present-day Lakewood. This was at a time when both nations laid claim to the Pacific Northwest. In 1841, the voyage of exploration expedition led by Lieutenant Charles Wilkes, reached Fort Nisqually. His crew charted the waters of Puget Sound, giving many of the places the names they bear today, including DRAYTON PASSAGE, named for Joseph Drayton the expedition’s illustrator/artist. Drayton gave the United States its first view of the Northwest”s greatest natural resource ….. trees. Over the next 30 years, loggers and farmers came and went. The Panic of 1893 caused Tacoma banks to close, business to fail, sawmills and logging operation to closed down. Many folks walked away from their farms to on the peninsula to go live with family members in Seattle and Tacoma. Ms Anderson has graciously researched a few of the earliest settlers on the camp property. The Sound View staff will further discover more about these farmers and the events that brought about Camp Wakoma and eventually, our beloved Sound View. Stay tuned!